We’re proud to introduce the latest version of Xobni for Gmail Beta (Production-48) Thanks to each of you who wrote in and posted in the forums. User feedback is always important, and it’s especially critical while a product is still in beta. We appreciate having such an active and engaged set of testers. To show thanks, we’re giving you some of your top-requested features! With this new update comes our top-requested feature: the ability to expand and collapse the Xobni sidebar at will. This enables you to have Xobni neatly tucked away to the right-hand side of your workspace for when you want to focus. When you minimize the sidebar, you’ll see summarized versions of contact profiles, inbox view, and even search results—all fitted discreetly into a slim 50 pixel-wide profile. To expand or collapse the Xobni for Gmail sidebar, just click on the left margin of the sidebar. Coming soon: pick your own color theme to match your unique Gmail setup. When composing an email, Xobni Autosuggest now instantly recognizes contacts that you’ve just emailed for the first time. 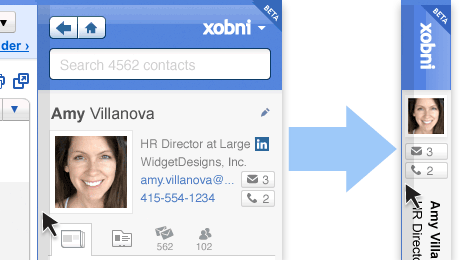 You may not have noticed this, but not only do we show you info on the contacts in your inbox, we also create Xobni Contacts for them. This means that you can search and find that contact even if you’ve deleted messages from them. What’s different about Xobni Autosuggest? When you compose a message, we suggest your Xobni Contacts. This comprehensive list includes everyone you’ve ever emailed with—whether it’s multiple Gmail accounts, Outlook, or BlackBerry. That means you have access to all of your contacts, ordered by who’s most relevant to you in your current account. To make things easier for you, Xobni Autosuggest now allows tabbing to navigate to the next text field. Profile picker for Facebook and Twitter now includes links to view profile. You can even paste in a user ID for Facebook. We’ll preserve your tab status while you navigate through contacts. If you like having Recent Emails open, it will stay open. When you go back, you’ll see the previous open tabs. Want Xobni in a separate browser tab? Search your Xobni Contacts and information while you’re not in Gmail. Just go to https://sidebar.xobni.com. How do I get the new Xobni for Gmail? For those of you with Xobni for Gmail installed, simply reload the page. Easy! For those of you who don’t have Xobni for Gmail yet, sign up here. As always, feedback is welcome. Visit the forums and drop us a line—we’d love to hear from you.